Mix a light application of a balanced organic fertilizer into the soil prior to planting. In early summer, drench plants with a liquid feed to support strong growth. Portulaca tolerates blazing sun and the delicate blossoms attract honeybees. Colors include red, orange, violet, white and pink. 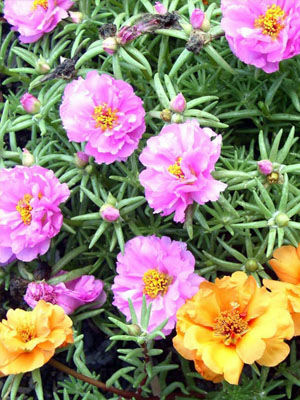 In climates with long summers, portulaca often reseeds itself with seedlings appearing in early summer.